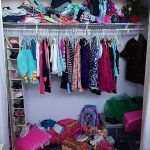 I see many closets as an organizer and some just need a bit of updating to achieve their closet goals. These are some of my favorite ways to update a closet without breaking the bank. Sometimes all it takes are a few simple changes to make your closet feel new again. 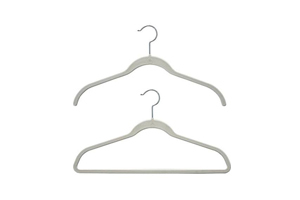 Changing your hangers is an inexpensive way to make an immediate impact. These are my favorite hangers because they take up less space and prevent clothes from slipping and ending up on the floor. If you can only afford to do one thing on this list, change your hangers. If you have drawers in your closet changing the hardware is simple, inexpensive and can make a closet feel new again. You can also add a valet rod for hanging one or several items. If you have a walk-in closet adding a throw rug adds warmth to the space and you will be surprised at what a difference it makes. Adding a small ottoman or bench in a closet allows you to have a place to put on your shoes. It’s a small addition but you will wonder how you lived without it! These acrylic shelf dividers keep sweaters, tops, and other items neat and organized on a shelf. Many people keep their clutches in cloth bags which makes it difficult to remember what you own. Using an acrylic collator allows you easy access but also adds a bit of glam to any closet. Use the vertical shelving space in your closet to stack containers for off-season items or other clothing essentials. It’s inexpensive and utilizes valuable space. Besides mismatched hangers lighting is one of the first things I notice when I go to consult in a client’s closet. Poor lighting really makes a difference in any closet small or large. The proper lighting allows you to brighten the space so you can see what you own. If you really want to make your closet look brand new a fresh coat of paint will do the trick. 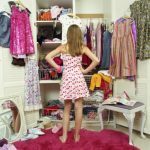 Emptying the closet may not seem like fun but the end result will really make you happy. 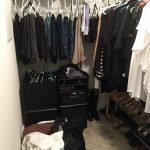 Are you short on closet space? Utilizing the back of the door with this will give you added shoe storage. If you have even the smallest wall space available this is perfect for hanging necklaces. 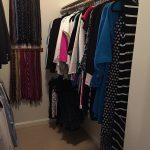 I hope this inspires you to clear the closet clutter and enjoy your new space!